It’s Halloween, but some environmentalists can’t take a break. In Louisiana, opponents to the proposed 163-mile long Bayou Bridge Pipeline headed to the Capitol today. And they brought pumpkins. Roughly 20 people went to demand Gov. John Bel Edwards require an environmental impact statement for the proposed crude oil pipeline, Cherri Foytlin, state director of Bold Louisiana, told Earther. With 10 pumpkins among them, organizers carried their various carvings to send a message. The theme was simple: No Bayou Bridge Pipeline. 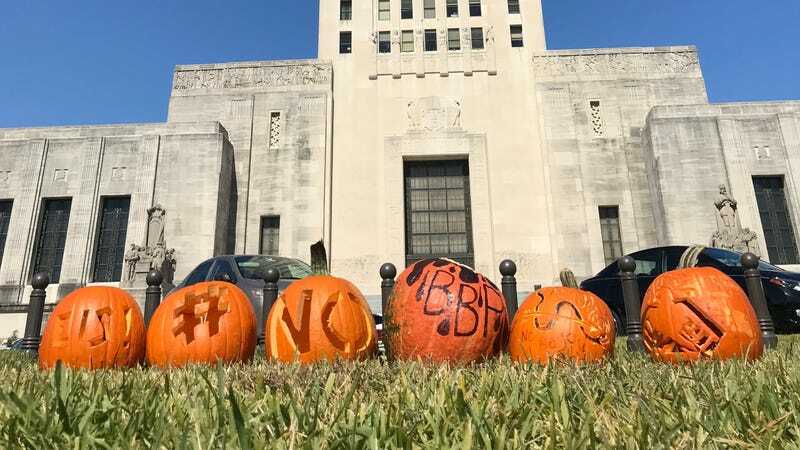 Activists set up their pumpkins outside Gov. John Bel Edwards’ home. They went to both the Capitol and Edwards’ home. The pipeline is owned, in part, by Energy Transfer Partners, the same company behind the Dakota Access Pipeline, which drew opposition from indigenous peoples around the world. Similarly, some indigenous leaders in Louisiana are worried what the crude oil pipeline could do to their water supply in the face of an incident—and to their lands. It’s set to connect the crude oil supply from the Bakken Formation in North Dakota to St. James, Louisiana, where it would run through wetlands. “Stop ETP,” the pumpkin reads, referring to Energy Transfer Partners. So far, the pipeline has received a permit from the state Department of Natural Resources, but opponents took that to court in May. The suit alleges that the state didn’t sufficiently analyze the project’s impacts on local communities. Until that’s resolved, the pipeline is awaiting permits from the Army Corps of Engineers and Louisiana Department of Environmental Quality. Environmental impact statements are a rarity in Louisiana for pipelines, but opponents to this protect are determined. These pumpkins—which read “Stop ETP,” short for Energy Transfer Partners and “Mni wiconi,” Lakota for “Water is life”—are just the latest reminder that the fight will go on. The last pipeline says, “Mni wiconi,” or “Water is life,” in Lakota.